Any event supplier knows that events and exhibitions require a huge amount of planning, materials, and labor. Each piece adds up quickly, making it important to help your customers set their budgets in advance to ensure you are prepared for each and every expense. 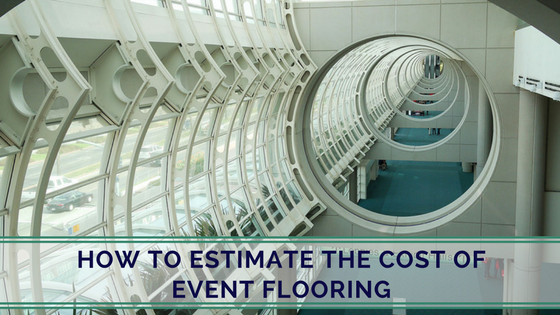 This can be a challenge when it comes to your event flooring since there are so many varying factors, but here are some general guidelines you can use to estimate their costs. Event Flooring: Rent or Buy? First, you need to know whether your customer is going to rent or buy their flooring. In general, exhibitors opt for flooring rentals. Rentals are often advantageous to customers because the flooring vendor takes care everything - shipping to the event, drayage, installation, and tear down. 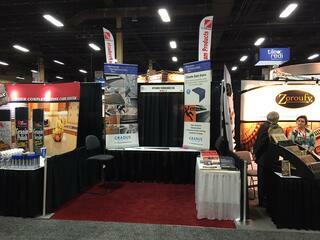 Plus, this gives your customer the option to change their exhibit’s look over time. Event display rentals are less expensive than purchasing, usually ⅓ or ¼ of what it would cost to buy. If your customer is considering purchasing event flooring, make sure they have space for storage in their office space; their budget covers shipping, drayage, and installation; and they are certain they will want their exhibit space to always look the same. Plus, they will be responsible for all costs associated with the event display, like shipping, storage, and labor. This can add up quickly. Shipping, for example, often tops $1,000 for each event. 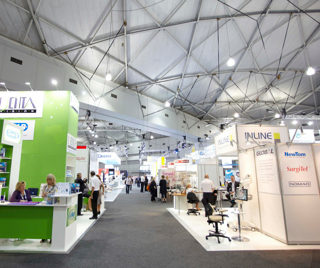 The cost of event flooring will vary based on your customer’s overall budget. Is the budget tight? They could spend as low as $1.20 per square foot for standard event carpeting. If they have a little more to spend, they could add padding for 70 or 80 cents per square foot. Or, they may really want to splurge and use an exotic, one-of-a-kind carpet, which can cost over $100 per yard. As you can see, it’s nearly impossible to calculate the average cost of event flooring, but we can explain how to determine the amount of carpet your customer will need. Once you have that figure, you can multiply it by the price per foot of whichever carpet they've selected to help them determine what will fit within their budgets. Add the length and width of the room, plus an extra foot for cutting. Multiply the width of the flooring by the number of linear feet. Divide that number by 9 to get the square yardage. The final piece of your customer’s event flooring budget is in your hands because it depends on the method of installation. Double-sided tape is the least expensive method. It can run as low as $2.50 for a 75-foot roll. Wet glue costs between 8 and 9 cents per square foot, but needs to be used on top of plywood or a polythene membrane so it doesn’t damage the flooring below. This can add significant labor and material costs. A pressure-sensitive dry adhesive will cost about 33 cents per foot, but it requires less labor and no additional materials so it is often less expensive than wet glue when all is said and done. Installation method isn’t just a cost decision, though. 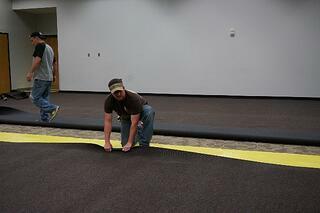 As you know, the best method depends on the types of flooring being used, the venue, the timeline, and other factors. If you’d like a recommendation for the best installation method for your project or have additional questions about event flooring, please contact one of our product specialists.